At least 1 of every 4 Americans suffer from allergies. To those people, daily life can be a struggle and range from mildly impacting the quality of life to life threatening episodes and complications. Allergy symptoms range from mild annoyances, to severe and life-threatening reactions. Allergy sufferers may even experience symptoms, such as frequent colds, sinus infections, and skin rashes, without realizing that the symptoms are caused by allergies. In addition to the annoyance and discomfort associated with allergy symptoms, many sufferers find that they are forced to avoid situations where their allergies may be triggered. Picture missing your daughter's first base hit. Or imagine your child being unable to go fishing with grandparents. Many suffers must withdraw from former hobbies, or avoid friends and family, with the onset of allergies. Fortunately, treatment methods are available which can alleviate allergies, or put them in long-term remission. Allergy management options continue to improve and the allergy doctors at Houston ENT study to latest in techniques and therapies. Traditional treatments include avoidance or reduced exposure, medications and Immunotherapy. If allergies affect you, or someone you love, speak with your healthcare provider today, to learn more about the various treatment methods. The symptoms associated with chronic sinusitis can severely impact quality of life. Many of these symptoms can be caused by improper sinus drainage, because the sinus openings are either too small, or they are blocked. If your symptoms are difficult to control with medications alone, your doctor may recommend surgery to improve sinus drainage. One such procedure, Balloon Sinuplasty, is a minimally invasive surgical option for the treatment of sinusitis. Balloon Sinuplasty is clinically proven to be safe, effective, long lasting and improve quality of life. After examination by your Houston ENT Doctor, you may both decide the Balloon Dilation is a good option for your treatment. During Balloon Sinuplasty, the Doctor provides a local anesthetic and locates the areas identified in your diagnosis. A small, flexible, balloon catheter is inserted into the nose, and into the sinus openings. When the balloon on the catheter is inflated, it gently restructures and widens the sinus pathway. With the pathway enlarged (dilated), the sinus can once again drain properly. The procedure is quick and typically requires about 30 minutes with the Physician. HOW LONG WILL RELIEF LAST FROM BALLOON SINUPLASTY? 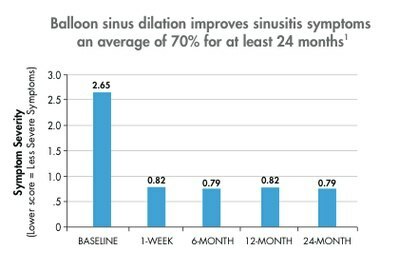 While typical medications relieve symptoms during use, Balloon sinus dilation can have lasting effects for up to 24 months. 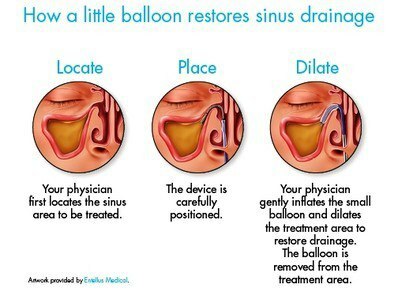 A quick recovery of 1-2 days can bring months of relief from sinus pressure and pain with improved drainage. If you have been diagnosed with chronic sinusitis and are not responding well to medications, you may be a candidate for Balloon Sinuplasty. Houston ENT phsyicians can perform your Balloon Sinus Dilation procedure in our offices as an In-Patient procedure. The thin wall inside your nose that separates your right and left nasal cavities, is called your nasal septum. Ideally, your septum is situated in the center of your nose, equally separating the two halves of your nasal cavity. In the majority of people, the nasal septum is displaced to one side, making one nasal passage smaller than the other. This is what is known as a deviated septum. Nasal polyps are small, sack-like growths made up of inflamed tissue lining the nose. They often occur in groups, like grapes on a stem. Small nasal polyps may cause few problems, but larger ones can affect your breathing, lead to sinus infections and diminish your sense of smell. Nasal polyps typically develop in the mucous lining of the nose, but they can also develop in one or more of your sinuses. Treatment for nasal polyps depends on many factors, so make sure you discuss all of your options with your doctor. Rhinitis, also knwn as Coryza, is an inflammation of the nasal passages, often associated with watery nasal discharge, nasal itching, and problems breathing through the nose. Potential causes include allergies, bacterial infections, and non-allergic vasomotor irritants such as medications or hormones or physical environment. Symptoms include sore throat, cough, congestion headached and rhinorrhea or runny nose. If you think you may suffer from rhinitis, you should speak with your doctor, and discuss steps to reduce the symptoms of this condition. Treatments for rhinitis will depend on the cause and severity of your rhinitis and can be determined with your physician. The sinuses are air-filled cavities that surround the nose and nasal passages. If these passages become inflamed, fluid can build up, and interfere with the drainage of mucus in the sinuses. This condition is called sinusitis. The sinus inflammation can be caused by infections from a virus, bacteria or fungus. A deviated nasal septum or other blockages can cause sinus infections and may be develop either acute or chronic sinusitis. Symptoms lasting more than 12 weeks or recurring multiple times within a year are considered Chronic Sinusitis. Your Houston ENT & Allergy doctor may use x-rays, CT Scan, and other tests to determine if you have Sinusitis. Treatment of sinusitis depends on the cause, and may include medications, self-care and prescriptions. Other treatment options for recurring or chronic sinus complications may be needed. If left untreated, sinusitis can lead to more serious infections or complications due to the proximity to the brain and other areas of the head.